Show everyone how much you "give a hoot" about breast cancer every time you wear your Breast Cancer Shirts. Feel good wearing this awareness shirt knowing you helped in finding a cure. 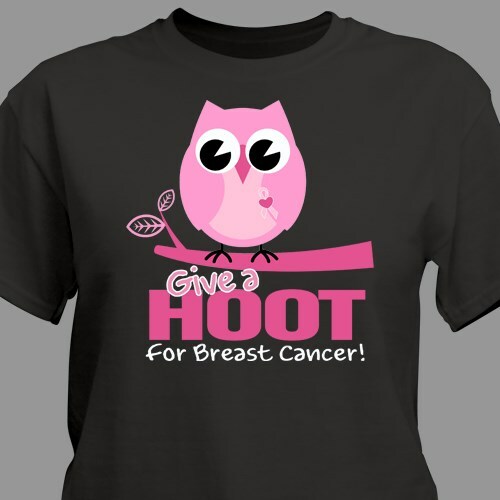 Our Give a Hoot Breast Cancer Awareness T-shirt is a great way to support the fight against Breast Cancer. This Custom Printed Breast Cancer Awareness shirt is available on our 100% cotton preshrunk t-shirt, machine washable in adult sizes S-3XL. This is my second give a hoot t shirt. I love it! love it very pleased! delivery was fast! My husband and I wore these the other day. We really do like them. The others are xmas gifts for our daughters. Shop all Breast Cancer Awareness Apparel & Walk Gear from MyWalkGear.com! You will also like this great and eye-catching design featured on our Give a Hoot Water Bottle & our Give a Hoot Key Chain as well.